Card Inspired by Maria: Stampin Up Starter Kit for $99 - Become a Demonstrator!! Stampin Up Starter Kit for $99 - Become a Demonstrator!! Hi Everyone, I don't mean to promote here but I want to get the word out. I'll try not to promote too much Stampin Up stuff on this blog but once in a while, I will because I have more readers on this blog site. . .especially, when there's a big promotion going on with Stampin Up. If you are interested in Stampin Up stuff, be sure to stop by my Stampin Inspirations Club Site. That's where I'll be posting the majority of all my Stampin Up projects and discuss the promotion and sales going on. Wanna be part of the Stampin Up family and be part of my team? If you sign up under me, receive a Stampin Spot Classic Ink Set in any color set of your choice. This set has a value of $22.50. You have until October 11 to sign up for the Starter Kit Special at $99. Click Here for the flyer or click on the photo to the right. You may also sign up with the Full Starter Kit at $199. Join as a demonstrator with the standard $199 Starter Kit and choose one stamp set out of the Fall-Winter Sampler or Idea Book & Catalog for free. Click on the picture to the left or click here. 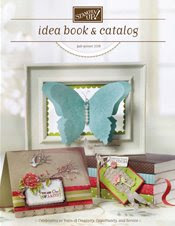 A free stampin' kit each month with different projects and card ideas to help you with your workshops or card classes. Access to my team site where we can interact online. We'll do RAKs, Swaps, and other fun stuff to help get our creative juices flowing!! Access to various tutorials to help give you ideas for your workshops. Downline coaching to help you build your business. Sharing ideas with other team members. I know many people who are interested in becoming a demonstrator already have many of their own Stampin Up products and don't want the full demonstrator kit. . .well, there is a great option for you. Stampin Up has a smaller version of their starter kit at a lower price. It has less products that are included in the kit but you have the choice to choose 3 different sets of products that comes along with your business materials. This is a great way to receive a few products and receive the business forms and materials you need to start up your Stampin Up business. This promotion is a great opportunity for you to start up your business but not have to cough up a lot of money to receive the kit!! Click Here to check out the flyer. From August 11-October 11, potential recruits will have the option of becoming a Stampin' Up! demonstrator by purchasing one of three special mini Starter Kits* priced at $99.